FORT LEONARD WOOD, Mo. (Feb. 6, 2019) — The 33rd annual Black Engineer of the Year Awards Science, Technology, Engineering and Math Conference is scheduled for Thursday through Saturday and one Fort Leonard Wood Soldier will be among the “best of the best” recognized at the event. 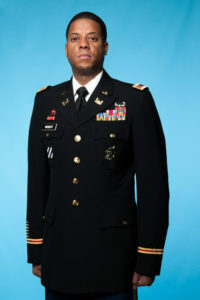 Chief Warrant Officer 3 Augustus Wright, U.S. Army Engineer School Department of Instruction, Geospatial Engineering training developer, will receive a 2019 BEYA STEM award for Modern-Day Technology Leaders Friday in Washington. “Geospatial technicians now leave the United States Army Engineer School with cutting-edge skills that better enable them to support the warfighter using modern technology,” Wright said. This is not the first award Wright has received over his 20-year career; he has also received the Army Engineer Bronze Order of De Fleury, the Intelligence Corps Knowlton Award, and has been nominated for the U.S. Army Engineer School’s 2019 Best Warrant Officer Award (active duty). “As a high schooler, I took four years of drafting and design, which is where I developed a love for geodesy and schematics,” Wright said. That love eventually led him to Geographic Information Systems with the Army. “When I began my military career, I spent three and a half years in combat arms working with explosives. One day an opportunity presented itself for me to reconnect with the kind of engineering I enjoy most,” he said. “The Army has given me the opportunity to get an education and to receive mentorship from some of the smartest American citizens. In return I am paying it forward by mentoring others and giving my best to move the torch forward in art, technology and humanity,” Wright said. After a long and successful Army career, Wright has some words of wisdom for Soldiers considering a career in geospatial engineering, “I would advise others entering this profession to do so with a lifelong learning mentality. Whenever a warrant officer is no longer able or willing to learn, he or she is also no longer able to be a competent technician. We need subject matter ‘smart’ experts. ‘Smart’ does not mean you know everything, it means you are able and willing to learn anything. Fort Leonard Wood’s Geospatial Engineering Division. “It feels good to be recognized, but I also feel like all I did was pull my share of weight for the team. We have an outstanding group of Warrant Officers and Civilian Educators that make up the Geospatial Engineering Division. The collective effort is what ensures the students receive the best training possible,” Wright said. “I would like people to know that my drive and determination come from my family. My wife, Wytisha, and our two kids are my inspiration. Lastly, my endurance and vision come from God. God has carried me throughout life,” he said. Chief Warrant Officer 3 Augustus Wright, U.S. Army Engineer School Department of Instruction, Geospatial Engineering training developer, will receive a 2019 BEYA STEM award for Modern-Day Technology Leaders Friday in Washington. Courtesy photo. Editor’s note: A photo of Wright receiving the BEYA STEM award Feb. 8 is expected to be available upon request to the Fort Leonard Wood Public Affairs Office at 573-563-4145.